Travel day from connecting city in Europe. Flight duration from London to Nairobi is about 9 hours with a 2-hour time difference. Everyone can expect to arrive in evening, where they'll be met at Jomo Kenyatta International Airport and transferred to the hotel located about 30 min away. Those arriving a day earlier may want to relax and time-shift or take one of our available day trips out of Nairobi. Night at Sentrim Boulevard Hotel in Nairobi. Early departure for the Oloololo Escarpment overlooking the western plains of Masai Mara, arriving mid-afternoon. Late afternoon photograph birds along the escarpment near the lodge. Some of the interesting birds likely there are Spot-flanked Barbet, Black-crowned Tchagra, Violet-backed Starling, and Yellow-fronted Canary. 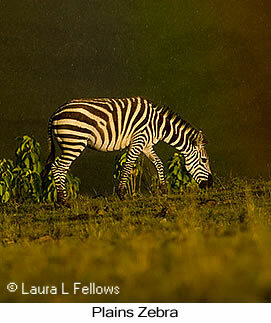 A number of mammals are usually present, especially Plains Zebra and Topi. Night at Mara West Tented Camp. Morning drive a dirt road along the Oloololo Escarpment bordering the western plains to photograph birds of dry bush and woodland habitats. Possibilities include Schalow's Turaco, Narina Trogon, Crowned Hornbill, Usambiro Barbet, Spot-flanked Barbet, Rufous-naped Lark, Flappet Lark, Miombo Wren-Warbler, Sooty Chat, and Pied Wheatear. Afternoon game drive on the western plains where mammals are most abundant. Highlights include photography of Elephant, Cape Buffalo, Topi, Hartebeest, Impala, Thompson's Gazelle, Grant's Gazelle, and Masai Giraffe as well as predators. Sadly, the Lion population has declined 80% during the past 10 years but small numbers can usually be found. Opportunities to photograph Cheetahs should be good as they tend to follow the Wildebeest herds that are present during much of dry season. Spotted Hyenas are more scarce than they once were as well but may be encountered on the western plains. Leopards are more difficult to find and photograph. These are most easily found around dusk in pockets of woodland but are sometimes encountered on the open plains. In addition to mammals, over 500 species of birds have been recorded in Masai Mara. Part of the time will be spent photographing birds of the open plains, bushland, and wetlands. Of special interest is Jackson's Widowbird, a spectacular lek-breeding endemic that is in full breeding plumage during dry season. Among the many other possibilities are Woolly-necked Stork, Saddle-billed Stork, Marabou Stork, Secretarybird, Temminck's Courser, and Yellow-throated Sandgrouse. Night at Mara West Tented Camp. This day features a transect across the plains eastward, soon reaching the Mara River where the famed Wildebeest migration and river crossings occur. Timing of the migration has been especially unpredictable in recent years. Large herds of Wildebeest migrate from Tanzania into Kenya usually in late July, ever seeking ungrazed grass for forage. 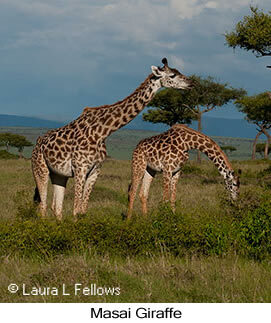 They typically remain in Kenya until October but sometimes leave earlier depending on the rains of that year. It may take some time and patience to actually see a crossing, as the Wildebeest and other animals such as Plains Zebra and Topi are very hesitant to cross the crocodile-infested waters of the Mara River if the water level is high. It's possible to photograph the crossing from a viewing platform constructed on the bank of the river without disturbing the animals. The remainder of the day will feature photography of birds and other mammals while driving eastward to the other side of Masai Mara. Night at Sentrim Mara Tented Camp. Morning game drive around the eastern section of the park where dry bushland predominates. The goal will be to photograph birds characteristic of this habitat, notably Magpie Shrike, a sociable bird of drier Acacia scrub, along with bustards, raptors, and various other birds and mammals of open bush. Mid-day transfer to Naivasha, arriving at Elsamere Centre before dark. En route stop along the road in Masai Land to photograph the quite locally distributed Speckle-fronted Weaver, a bird of arid scrub. Night at Elsamere Centre (George and Joy Adamson's former home) near Lake Naivasha. Lake Naivasha is one of two freshwater lakes in the Rift Valley (the other is Lake Baringo). The lake is fringed with Papyrus reedbeds and surrounded by Acacia woodland. 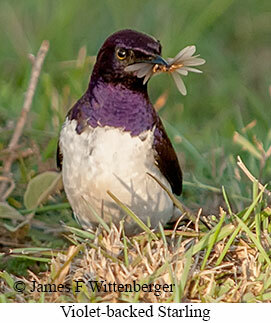 Bird photography around the lodge grounds and along some trails near the lodge can be very rewarding. Possible birds that can be photographed include African Hoopoe, Green Woodhoopoe, Sulphur-breasted Bushshrike, Arrow-marked Babbler, Amethyst Sunbird, and Red-headed Weaver. The Papyrus beds are home to Greater Swamp Warbler and Lesser Swamp Warbler. 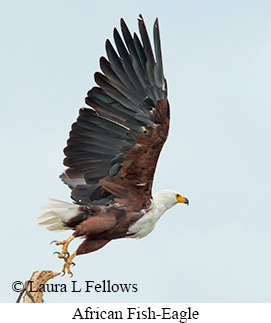 A mid-day boat trip on Lake Naivasha will be a pleasant interlude and offer excellent chances to photograph African Fish-Eagle and many aquatic birds. An afternoon game drive in the national park offers some good mammal photography. Night at Elsamere Centre. Morning photograph birds around Elsamere Centre. Depart for Buffalo Springs National Reserve, stopping en route for a side trip up the access road to Aberdares National Park. Birds of particular interest are Malachite Sunbird, usually seen well up the road near the entrance to the national park, Jackson's Francolin, Cinnamon-chested Bee-eater, Gray-backed Fiscal, Hunter's Cisticola, Schalow's Wheatear, Golden-winged Sunbird, and Northern Double-collared Sunbird. Arrive late afternoon. Buffalo Springs is immediately adjacent to Samburu National Reserve, separated by the Ewaso Nyiro River. Buffalo Springs and Samburu National Reserves are within the tribal lands of the Samburu people, a tribal group closely related to the Masai farther south. The Samburu wear colorful clothing and decorative beads. They're largely herders of camels and goats and may be encountered outside the reserve boundaries. After arrival photograph birds around the tent camp before dark as time permits. Night at Ashnil Samburu Tent Camp. Buffalo Springs is less arid, less rugged, and more open than adjoining Samburu National Reserve. The habitat is gently rolling lowland plains marked by stands of Doum Palms, a large spring that gives the reserve it's name, and Acacia woodland along the rivers. The day will be devoted to a game drive through the reserve. Specialty birds of the open plains include the blue-necked Somali Ostrich and the strikingly plumaged Vulturine Guineafowl. 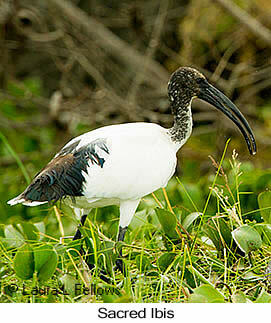 A visit to the springs for which the park is named should provide opportunities to photograph wetland birds such as African Openbill, Abdim's Stork, Goliath Heron, Hamerkop, Sacred Ibis, and Hadada Ibis. 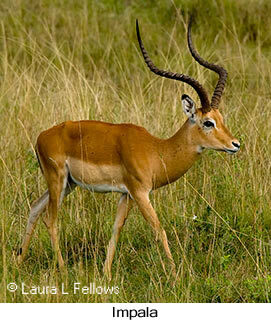 Several mammals found at Buffalo Springs and Samburu are of special interest since they aren't present further south, notably the endangered and quite striking Grevy's Zebra, the strange long-necked Gerenuk antelope, and the beautiful Reticulated Giraffe, a separate subspecies from the more southerly Masai Giraffe. Also likely are chances to photograph Lion and Cheetah, along with large numbers of Elephant that come down to the river to drink. Leopards are regularly encountered in the woodland, especially in early morning and at dusk. Night at Ashnil Samburu Tent Camp. Samburu National Reserve features rocky escarpments, hilly terrain, semi-arid grassland, and riverine forest. The entire day will be spent in the reserve, concentrating on birds of riverine forest in the early morning. Specialty birds characteristic of northern and eastern Kenya targeted here include White-headed Mousebird, Northern Red-billed Hornbill, Somali Bee-eater, Bristle-crowned Starling, Kenya Violet-backed Sunbird, Black-capped Social-Weaver, and White-headed Buffalo-Weaver. On the open plains and bushed grassland are Yellow-necked Francolin, Palm-nut Vulture, Hooded Vulture, Martial Eagle, Buff-crested Bustard, Somali Courser, Black-faced Sandgrouse, Lichtenstein's Sandgrouse, Rosy-patched Bushshrike, Golden-breasted Starling, and Golden Pipit. 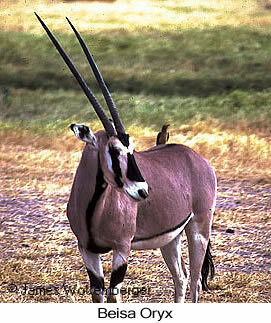 Many mammals will be present as well, mostly the same ones mentioned above but also Beisa Oryx, a beautiful antelope found in the drier parts of the reserve. Night at Ashnil Samburu Tent Camp. Morning photograph birds and mammals in Buffalo Springs Reserve. Mid-day depart for Mt Kenya National Park. The first night will be spent at Naro Moru Lodge, located on the well forested banks of the Naro Moru River not far from Mt Kenya National Park. Animals come in to drink at the river in late afternoon and evening so some game viewing is available. Night at Naro Moru River Lodge. All day drive an altitudinal transect into the highlands of Mt Kenya, starting in forest and reaching moorland around 10,000 ft. On a clear day the peak will be plainly visible. 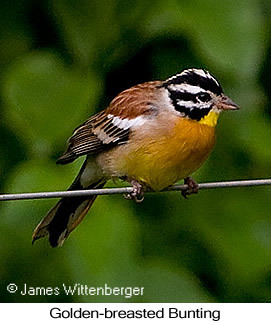 Stops along the road offer chances to photograph a variety of birds such as Hartlaub's Turaco, Bar-tailed Trogon, White-headed Woodhoopoe, White-headed Barbet, and Golden-breasted Bunting. 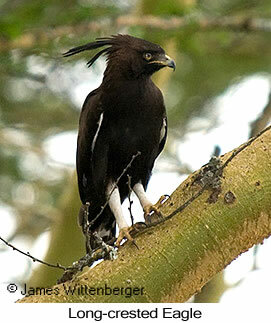 Several raptors are possible including Martial Eagle and Crowned Hawk-Eagle. At higher elevation the road opens up into moorland where Jackson's Francolin is likely and eventually reaches a strange forest of Giant Heath where a few birds such as Moorland Chat and Malachite Sunbird occur. Arrive at Serena Mountain Lodge by late afternoon. The lodge is located adjacent to a water hole where game animals visit at dusk. It's possible to see Cape Buffalo, Bushbuck, Common Duiker, and Red Duiker visiting the water hole while Egyptian Mongoose and Genet cats frequently put in an appearance after dark. Night at Serena Mountain Lodge. After breakfast depart for Nairobi. Lunch at Castle Forest Lodge, where the grounds offer good chances to photograph Silvery-cheeked Hornbill and possibly the endemic Abbott's Starling, a rather striking black and white bird restricted to highland forests. Other birds that might be photographed include White-eyed Slaty-Flycatcher, Eastern Double-collared Sunbird, Gray-headed Negrofinch, and Yellow-bellied Waxbill. From there proceed to Nairobi, with stops en route aimed at photographing the endemic Hinde's Pied-Babbler and wetland weavers such as Grosbeak Weaver. Continue on to the international airport outside Nairobi. Tour ends at the airport.